One of Master Eraqus's pupils. He usually goes by "Ven" for short. He and Terra and Aqua train together, sharing both a healthy rivalry and a strong bond of friendship. Since Ventus is younger, Terra and Aqua tend to be very protective of him. Haunted by the masked boy's warnings about Terra, Ven defied Master Eraqus, ran away from home, and set off for the outside world to find his friend. One of three Keyblade wielders who played a pivotal role in a historic clash more than a dozen years ago. His heart is sleeping, and he has been laid to rest in a secret chamber of a certain castle until someone can wake him up. Master Eraqus's pupils. The three are best friends, but also rivals. One of three Keyblade wielders who trained under Master Eraqus. His heart fell into slumber at the end of the battle over the χ-blade more than a decade ago. Since then, Aqua has kept his body hidden away in the Chamber of Waking. Ventus's deep connection with Aqua was what ultimately woke him from his sleep within Sora's heart. "I've become a part of their heart, just as they've become a part of mine. My friends are my power... and I'm theirs!" Ventus, also known as Ven, is one of the main protagonists in Kingdom Hearts Birth by Sleep. He was a Keyblade wielder before Sora ever became one, and was apprenticed to both Xehanort and Eraqus. He is the youngest of the trio formed by himself, Terra and Aqua. Ventus's heart is severely damaged by the creation of his dark counterpart, Vanitas, and then again when the χ-blade forged from their hearts is destroyed. Both times, Sora's heart reaches out to mend Ventus's heart, and by the end of Kingdom Hearts Birth by Sleep, Ventus's heart has gone to sleep within Sora so that it can recover until it is fully healed and ready to rejoin his body, which lies comatose but safe within the Chamber of Waking. When the time comes to discuss the matter of the Shift Pride, Ephemer calls a meeting between the Union Leaders. Lauriam does not attend, with Brain explaining that, whatever the agenda is, Lauriam asked to side with Ephemer. Proceeding, the group discusses the nature of the Shift Pride. Having not initially understood what the Shift Pride was, Ventus rejects the notion, not wanting to see wielders fighting one another again, to which Skuld concurs. Brain affirms that it is a law, and thus they should follow through with it, also believing that a little recreational contest would be fun for everyone. When Ephemer admits that he wants to follow the rules, the vote is in favor of the Shift Pride. Ephemer then explains that he intends on having wielders compete against the data versions of their comrades to avoid a clashing of hearts, admitting that Lauriam had given him the idea. The group wonders about who Lauriam could be looking for, but on Brain's suggestion, they decide to wait for Lauriam to come to them rather than pry. Lauriam soon joins them, but rather than wanting to discuss the Shift Pride, he asks Skuld what she knew of his sister, Strelitzia, explaining that Strelitzia had been looking for someone and was last seen entering the same building Skuld had just prior to the Keyblade War. Although Skuld doesn't offer much insight, Lauriam accepts this and worries that Strelitzia may have ended up fighting in the Keyblade War after all. Brain notes that the entire situation seems odd, and after reviewing the information Ephemer is reminded of Player, then leaving with Lauriam to reconnect with Player. Left alone with Brain and Skuld, Ventus periodically looks to Brain as he reads from the copy of the Book of Prophecies. When Brain takes notice, he asks Ventus what's wrong, with Ventus noting how Brain seems to be constantly reading the Book of Prophecies and asking if he'd been researching something. Brain reveals that he has a goal, and that at present, they are still following a destructive destiny, one which he intends to overwrite. Mentioning that, even if they overwrite the Keyblade War, nothing would change, Brain resolves to become a virus to overwrite that destiny, then leaving to enter the control room. While alone, Ventus asks Skuld her opinion on what Brain had said, with Skuld suggesting that Brain knows what he's doing, but questioning why the Dandelions were allowed to avoid the Keyblade War when they were destined for ruin anyway. Ventus then suggests that they talk to Ephemer about this, but just then, a glitch triggers a projection of Ava and the Masters of Masters, where they discuss the Union Leader meant to inherit the copy of the Book of Prophecies. Seeing this, Ventus immediately asks where Brain is, leaving to get him when Skuld gives him an answer. Master Xehanort extracts the darkness in Ventus's heart and creates Vanitas. Four years before Aqua and Terra take their Mark of Mastery exam, Ventus served as an apprentice to Master Xehanort, as part of the elderly Keyblade Master's plans to forge the legendary χ-blade. However, Ventus proved to be a poor candidate, and when he refused to use his darkness to fight several Neoshadow Heartless in the Keyblade Graveyard, Master Xehanort finally lost patience with him and used his own Keyblade to unlock and extract the darkness from Ventus's heart, using it to form a being of pure darkness who was then named "Vanitas" by Master Xehanort. Unfortunately, the process left Ventus in a comatose state, with his broken heart of pure light slowly fading out. Master Xehanort, disguised in a black coat, then took Ventus to the Destiny Islands to allow him to live out his last days peacefully. Ventus was sent to the Dive to the Heart, where he came in contact with the heart of a newborn Sora. After a brief discussion, Ventus's heart connected with Sora's, halting its deterioration and allowing Ven to stay alive until he someday becomes strong enough to repair the damage by himself. Ventus then summoned a Keyblade and shot a ray of light into the sky above, much to Master Xehanort's surprise. Xehanort decided that Ventus could still be of use in his master plan, but with Ventus still too weak in comparison to Vanitas, the two boys could not be trained under him since Vanitas had a naturally strong impulse to destroy Ventus. Ventus, Terra, and Aqua take a break from their practices. To prevent this, Xehanort brought Ventus to Land of Departure, where he could train as an apprentice to Master Eraqus. Terra and Aqua met Ventus with open arms. However, when Terra asked Ventus about his past, he screamed out in agony, eventually falling unconscious. Eraqus revealed that this was because Ven had lost his memories. Afterwards, he remained asleep for some time. As he slept, Aqua kept watch over him, to keep him safe. Some time later, Ven woke up. Overjoyed, Aqua quickly alerted Eraqus and a worried Terra about Ven's recovery. It was then that his heart began to heal and he started to form strong bonds of friendship with Terra and Aqua. During a training session, Ventus loses humiliatingly, but Terra and Aqua reassure Ven that he was getting stronger. As time went on, Terra and Ven grew close, forming a strong bond. Terra even went so far as to give Ven his wooden training Keyblade and recite a mock Bequeathing ceremony. Together, the three of them shared the same dream: to become Keyblade Masters. Years later, Ventus awakens to a meteor shower and hurries out to look at the stars. Later, both Terra and Aqua join him. When Ven asks about stars and the light, Terra explains how each star is another world and compares the light to Ven, who doesn't understand. After a brief spat between the two boys, they, along with Aqua, spar in order to prepare for the Mark of Mastery exam the next day. Following their workout, Aqua gives both Ven and Terra good luck charms and tells them the story behind the charms. The charms, also known as Wayfinders, were gifted with a powerful magic that formed an "unbreakable connection". Upon receiving the charms, Ven and his friends return to their castle for the night, eagerly awaiting the exam. However, things don't go smoothly. During the exam, Master Xehanort rigs the test, and the orbs of light attack Ven and his friends. Together, the three fight off the orbs, and the exam continues. Vanitas teases Ventus and tells him Terra will fall to the darkness. After the exam, it is clear that Ventus has earned the interest of Master Xehanort and his apprentice, Vanitas. Though their intentions are rather ambiguous at the time, Vanitas decides to give Ventus some incentive to leave his home. When Vanitas appears in Ven's room, he leaves dark hints of Terra's fate and how he'll "become a different person". Ven becomes very defensive, telling Vanitas that he doesn't know the first thing about Terra. However, once Vanitas leaves, via the Corridor of Darkness, Ven hurries out to find his friend in hopes of giving him a warning. Unfortunately, Ven arrives much too late, as Terra leaves to go on his mission. Left with no other choice, Ventus leaves his home and begins a journey of his own. Ven visits a number of worlds and builds new friendships along the way. In the Dwarf Woodlands, he helps Snow White escape the woods and guides her to the Dwarfs' home. There, he learns that Snow White encountered Terra and immediately tries to get to the bottom of things. After facing several more Unversed along the way, Ven encounters the Queen in the form of an old lady, and she tells Ven that Terra threatened her with his Keyblade. Refusing to believe this, Ventus leaves in hopes of finding Terra, wondering what's gotten into him. Later, in the Castle of Dreams, Ven befriends Jaq and Cinderella. Though Terra isn't there, Ven still lends a hand, helping gather supplies for Cinderella's dress, and even facing Lucifer. When the dress is complete, Cinderella thanks Jaq and Ventus, and the two talk about their dreams. It's at this point that Ven decides that his dream is to become a Keyblade Master; the dream he and his friends all share. Ventus teams up with Mickey to defeat Vanitas. While in Enchanted Dominion, Ven gets another clue regarding Terra. After freeing Princess Aurora's heart, Ven encounters Maleficent. Maleficent reveals that Terra helped steal Aurora's heart, but Aqua arrives just in time to convince Ven otherwise. She then asks Ven to go home with her, but he refuses, remembering the cryptic warning left by Vanitas. Ven encounters Vanitas again after leaving Enchanted Dominion, and he follows him straight to the Keyblade Graveyard. There, Ven tries to get some answers out of Vanitas, who simply restates what he said before: that Terra will be gone forever. The two battle, but Vanitas easily outmatches Ven and nearly kills him. King Mickey arrives in time to save Ven and assists him in his battle against Vanitas. Upon his defeat, Vanitas tells Ventus that he is on probation and disappears, leaving Ven and Mickey alone. The two introduce themselves to one another, and Mickey tells Ven about how the Star Shard allows him to travel to different worlds. However, Mickey remains unaware of all of its secrets. Shortly after, the Star Shard sends them both to Radiant Garden, and Ven tries to follow Mickey, only to be intercepted by Aeleus and Dilan. After spying an Unversed, Ven gives up his search for Mickey and instead trails after the monster. He's interrupted several times, by Scrooge McDuck, who gives him lifetime passes to Disney Town, and Merlin, who tells him of the book to the 100 Acre Wood. Eventually, he does find the Unversed he was chasing, as well as Terra and Aqua. Together, they face the Trinity Armor, but after its defeat, things change for the worse. First, Aqua tries to tell Ven to go home, and then she and Terra get into a fight regarding the darkness and Eraqus's intentions. The whole time, Ven is left completely confused, as he'd never seen his friends bicker in such a way. In the end, he tells Aqua that she's let being a Master go to her head, and he leaves to find Terra again. His search is interrupted again, when he spots Ienzo being attacked by the Unversed. Without any hesitation, Ventus protects the boy and defeats his attackers. Even arrives shortly after and thanks Ventus for his help. Then, when asked about Terra's location, he tells Ven to look in the Outer Gardens. Terra tells Ven that he knows he can always count on him to be there when he needs to. Though Ven does find Terra, their reunion is short lived, as Terra leaves, telling Ven that he can't come along, but that they will meet again when they need each other. Meeting up with Aqua again, Ven asks to come along, but Aqua orders him to return to the Land of Departure in a somewhat harsh manner. Seeing Ven's disappointment, Aqua softens and explains that she merely doesn't want him to get hurt before departing. For a while, Ven stays in Radiant Garden, reminiscing about the times when his friendship wasn't strained by newfound complications. He's left wondering just what it means to be friends, and after meeting Lea and Isa he becomes more and more curious about friendship. Thus, Ventus decides to continue his travels with a new resolve. Rather than search for Terra and Aqua, he decides to go out and make some new friends in hopes of redefining his simplistic views of friendship. It doesn't take long for Ven to find companions, as he quickly meets Zack and Hercules in Olympus Coliseum. After stopping an Unversed threat, Ven finally comes to understand what it means to be friends, and realizes that he, Terra, and Aqua will patch things up someday. Ventus decides to part with the wooden Keyblade Terra once gave him. Eventually, Ventus finds Mickey's Star Shard in Neverland, only to have it stolen, along with Tinker Bell, by Captain Hook. He teams up with Peter Pan and the Lost Boys to defeat Captain Hook. Afterwards, Ventus, along with Peter and the Lost Boys, decide to put their own personal treasures in the empty chest they stole from Hook. As the Wooden Keyblade holds many cherished memories for Ven, he puts it in the chest, believing his best memories with Terra and Aqua are still to come. With Hook out of the way, he also retrieves the Star Shard from Tinker Bell after a little persuasion from Peter, only to be whisked away to the Mysterious Tower. Upon his arrival, Ven meets Donald Duck and Goofy, who take him to speak with Yen Sid. Ven is informed that Mickey went missing, but when Yen Sid uses his magic to find him, they discover that the King is in danger. Determined to save Mickey, Ven departs from the Tower and returns to the Keyblade Graveyard to find him. Xehanort reveals his plans for Ventus. However, he also encounters Master Xehanort, who was waiting for his arrival, and reveals Ven's destiny to forge the χ-blade. He tells Ven that this is the real reason why he was never allowed to leave home and constantly told to return, out of fear for the χ-blade's creation. After learning of his past, Ventus returns to Eraqus, only for his Master to try and destroy him upon realizing Xehanort's plans. Fortunately, he is saved by Terra and sent to Destiny Islands, much to his displeasure. There, he encounters Vanitas again, who taunts Ven into remembering how Master Xehanort broke their heart in twain. Once the memories return, Vanitas decides to give Ventus a reason to fight: Vanitas tells Ventus to come to the Keyblade Graveyard, the only place where the χ-blade can be forged, and threatens to kill Terra and Aqua to see if Ventus will continue to "play the pacifist." Left with no choice, Ven leaves in hopes of setting things right, once and for all. Once reunited with his friends, Ventus explains the situation between himself and Vanitas, and, admitting that he is terrified over the very thought of the χ-blade, asks to be destroyed in the event that he does have to fight Vanitas, much to their shock. However, there's little time to mull over Ven's request, as both Master Xehanort and Vanitas arrive. During their final battle at the Keyblade Graveyard, Master Xehanort encases Ven in ice and throws him off a cliff. Aqua manages to catch him before he hits the ground. Braig quickly appears and fights Aqua. Stalling long enough, Braig withdraws from the battle. Vanitas knocks out Aqua as he drops down from a cliff. Before the enigma can finish her off, Ventus uses all of his willpower to thaw out of his frozen state and encounters Vanitas. Ven then fights Vanitas and seemingly emerges victorious. After the battle, Vanitas reveals his true intentions and explains that the Unversed came from his own emotions and negativity. Trapping Ven with several Floods, Vanitas merges with Ventus and takes over his body. The fusion completes Ventus, but Vanitas keeps control over the body. As a result of their union, the χ-blade is forged. However, Mickey arrives on the scene and helps Aqua awaken. Together, they engage Ventus-Vanitas in a battle and emerge victorious, causing the χ-blade to be damaged by their fight. As this happens, Vanitas and Ventus engage in a metaphysical battle, where Vanitas tries to complete his fusion with Ventus and complete the χ-blade. Ven, however, refuses and chooses to defeat Vanitas and destroy the weapon, even if it means the destruction of his own heart, because of his devotion to his friends. The two engage in a decisive battle, and towards the climax, Vanitas forces a D-Link on Ventus in hopes of completing their fusion. Ventus instead took advantage of the powers the D-Link granted him and used it to destroy the χ-blade along with Vanitas. Unfortunately, this also damages Ventus's heart and causes it to flee his body, leaving him in a comatose state. Despite being comatose, Ventus was able to summon his Keyblade and lead Aqua back to the Land of Departure. Ventus sleeping in the Chamber of Waking. Aqua later places his body in a chamber and transforms the Land of Departure into Castle Oblivion. Though Ventus's heart was initially lost in darkness, Sora was able to sense Ventus's pain due to their previous encounter. Sora, with encouragement and guidance from Riku, called out to Ventus's heart and safely guides it to himself. After a brief conversation, Ven asks Sora if he could stay with Sora while he slept, to which Sora happily accepted. With this, his heart passes on into Sora's body, keeping it from deteriorating any further and granting Sora the ability to use Ventus's Keyblade in addition to his own. Aqua encounters a vision of Ventus sleeping in Snow White's coffin. In the Realm of Darkness, Aqua encounters a vision of Ventus sleeping in Snow White's coffin. Upon closer inspection, Ventus disappears. Later, Aqua encounters phantoms of Terra and Ventus, pursuing them through the Forest of Thorns. When she catches up with them, Terra explains to her that his heart is tied to the darkness and that the Ventus beside him is an illusion created by her heart. Aqua wonders if this means Ventus and Terra are safe on the outside world, and while Terra thinks so, he warns her that Xehanort is looking for Ventus. As Aqua assures him that she has hidden Ventus somewhere where no one will find him, Terra's spirit transforms into Terra-Xehanort. Terra-Xehanort wonders if Ventus is in the Chamber of Waking and, when questioned by Aqua, begins to reveal his identity. However, Terra overpowers Xehanort's will, informing her of Xehanort's ruse to learn of Ventus's whereabouts. Some time after Marluxia's recruitment, Zexion and Xigbar discussed how Xemnas ordered the construction of the Chamber of Repose and how he seals himself in there talking to his "friend", which in reality was Aqua's discarded armor. They further discussed that the Chamber of Repose is one of a pair, with the Chamber of Waking being the other and that is where Xemnas would find Ventus, whom Xigbar referred to as his other "friend". When Sora learns that Kairi's heart has taken refuge within his body, he uses the Keyblade of heart to free her heart, which also releases his and creates his Nobody, Roxas. For unknown reasons, Ventus's heart remained within Sora's body, causing Roxas to take on Ventus's appearance instead of Sora's. Saïx assigned Roxas to Castle Oblivion and ordered Axel to accompany him. As soon as Roxas entered through the door, his close proximity to Ventus, due to carrying Ventus's heart, caused Roxas to suddenly become weak and fall unconscious. It was hinted Ventus's memories were rushing into Roxas as Roxas complained about "so much being rushed into his head". Xigbar sees Xion (an imperfect replica of Roxas) as Ventus. Xigbar states that Ventus had always looked at him as if he had "drowned [his] goldfish" before he is defeated by Xion. Ventus is also alluded to many times by Xemnas, who desperately seeks to find him in the Chamber of Waking. Xemnas sends Axel numerous times to Castle Oblivion to locate Ventus, but Axel never succeeds. "That's right! He used to give me that same exact look!" When Sora is first accosted by Organization XIII at Hollow Bastion, Xigbar stays behind to taunt him, at one point comparing his glare to the one Ventus once showed him as Braig. When Sora runs into Xigbar at The World That Never Was, he remarks that Sora doesn't look like "half the hero" Terra, Ventus, and Aqua were. Data-Naminé tells Mickey and Data-Sora that Ventus is one of the ones connected to Sora's heart that must be saved. Later on, Mickey tells Yen Sid that they may be close to finding Ventus's heart. A vision of Ventus appears within Sora's data. When Sora travels to The World That Never Was, he is plagued with illusions by Young Xehanort, Xemnas and Xigbar in an attempt to get him to fall asleep and leave his heart vulnerable to damage. In one illusion, Sora takes on Ventus's form before Terra and Aqua, and apparently feels Ventus's pain of losing them again, prompting him to run after Terra and Aqua as they walk away. 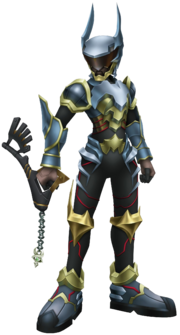 Following Sora's descent into darkness after his heart is damaged by Xemnas and Young Xehanort, Ventus's heart envelops Sora in Ventus's Keyblade Armor in order to protect him from being swallowed completely, though it is temporarily corrupted by the darkness until Riku saves him. He later appears inside the research data that Ansem the Wise hid inside Sora a year ago, but Riku, having never met Ventus before, initially mistakes him for Roxas. Physically, Ventus continues to sleep within Castle Oblivion. At the same time as Sora returning to Traverse Town and reuniting with his Dream Eater Spirit friends, Ventus slightly smiles from Sora's happiness. Shortly after defeating Randall in Monstropolis, Sora and co. are confronted by the revived Vanitas, who had sent the Unversed to that world in the hopes of re-completing his heart with negative emotions. Realizing that was not enough, Vanitas decides to forcibly take out the sleeping half of himself that resides within Sora. Attacking Sora, Vanitas revealed the connection the two have with each other. Goofy added that Ventus's heart was lost after his fight with Vanitas years ago. While venturing across space in the Gummi Ship, Sora and company are contacted by Ienzo with some news. He had deciphered part of Ansem's Code and discovered that Sora has three unique hearts within his body aside from his own. They identify two of them as Roxas and Ventus, but do not realize the third heart is Xions. Ventus is mentioned by Lea while he is talking with Kairi. He tells her how he met Ventus years ago, but forgot about him until he met Roxas, who looked identical. He goes on to tell Kairi that he never told Roxas this, out of fear that he might disappear too, and that Ventus is one of the three missing Keyblade wielders that Sora and Riku are looking for. Lea worries that Ventus will have forgotten about him like he did, but Kairi remains confident that Ventus will never forget Lea. Ventus reunites with Aqua after awakening from his comatose state. After her return to the realm of light, Aqua has Sora, Donald, and Goofy accompany her to Castle Oblivion, intending to retrieve Ventus. After unlocking the castle's Keyhole, thus restoring it to the former glory of the Land of Departure, the group heads inside and find Ventus's body. Aqua quickly realizes his heart has not returned yet. Vanitas appears, having followed them with the intention of taking Ventus' heart for himself. Aqua attempts to protect Ventus by herself, but gets injured after taking a blast from Vanitas. As the Vanitas prepared to deliver the final blow to kill Aqua, Ventus' heart reacted within Sora's heart, helping the latter unlock his power of Waking. Ventus's heart is returned to its body, and he launches himself at Vanitas, saving Aqua. After Vanitas departs, Ventus reunites with Aqua and meets Sora face to face for the first time. They all depart back to Yen Sid's castle. Yen Sid is happy that both Aqua and Ventus have returned, though Mickey tells them that they still haven't found Terra yet. Both Ventus and Aqua are confident that they will find him and bring him back. As Lea rambles about how confusing everything has become, Ventus calls him by name. Lea is shocked that Ventus still remembers him, to which Ventus affirms that they are still friends. Regarding Terra, Ventus reaffirms his promise to find him. Ventus tells Aqua about his dreams while he was asleep. With their clash against the seekers of darkness imminent, Aqua and Ventus take time to stargaze outside. Ventus uses this moment to admit to Aqua that while he was sleeping, he would have dreams of her, Terra, Sora, and the others. He also expressed memories of weird animal creatures. Aqua says that she's been places too, but she can't wait until things are back to the normal. Ventus and Aqua hold their Wayfinders to the sky, promising to share their stories with Terra after they save him. The next day, Ventus and the other Guardians arrive at the Keyblade Graveyard, where they are immediately confronted by Master Xehanort and his various incarnations. Ventus sees Terra in the middle of the wasteland, but Aqua immediately realizes that it is not Terra. Her suspicions are confirmed when Terra's hair goes from brown to white, revealing himself to be Terra-Xehanort. Mickey concludes that Terra-Xehanort is the thirteenth member of the Real Organization. Terra-Xehanort tells them that they will lose this fight, that all their hearts will be torn apart one by one. Nonetheless, Terra-Xehanort assures them that the χ-blade will be forged. Terra-Xehanort attacks both Lea and Ventus, removing them from combat, and while Donald destroys Terra-Xehanort with Zettaflare, the Demon Tide proceeds to take advantage of their weakness and eliminate Aqua, Ventus, Mickey, Donald, Goofy, Lea, and Kairi. While Sora is distraught over the loss of his friends and yields to the Demon Tower, Riku defends his friend long enough to reinspire hope in Sora's heart before both are consumed by the darkness as well. Thanks to Kairi, Sora is able to maintain his existence in The Final World. When he is restored, he is returned to the moment in which he and Riku were consumed by darkness, at which point Sora reaches out to Riku's heart and is guided to him as a Lich attempts to draw Riku's heart into the deepest depths of darkness. Sora manages to release Riku's heart, alongside Aqua's and the others, battling the Lich time and time again in order to restore his fallen friends. When Kairi guides Sora back to the Keyblade Graveyard, the group restarts their encounter with Terra-Xehanort, but when Terra-Xehanort attempts to attack Ventus, the Lingering Will intervenes, having been guided to the guardians of light by Naminé. Seeing the Lingering Will struggle in the battle, Ventus moves into help, but Aqua stops him and says they need to handle the Demon Tide coming from behind them. Then, when it seems darkest, Sora is aided by the light of the past in taking down the Demon Tide. Yen Sid then takes this opportunity to cast back the Heartless in order to allow the guardians of light to proceed, with Donald and Goofy staying behind in order to help. Ventus shares a tearful reunion with Terra and Aqua. The guardians of light are subsequently separated by Xehanort when he creates the Skein of Severance between them. Ventus and Aqua are drawn into battle against Terra-Xehanort and Vanitas, and when Sora arrives they are able to destroy Vanitas. However, when they attempt to reach out to Terra, Xehanort uses the emotional bonds between them to create physical chains imprisoning them, and attempts to execute them with a brutal impact. Ventus sheds a tear, feeling he has failed his promise to Terra, but Terra-Xehanort's shadow breaks free of its restraints and reveals itself as Terra's heart, breaking the chains on Ventus and Aqua and declaring that it will set things right. Sora then steps in to unlock Terra-Xehanort's heart, in order to release Terra's heart from Xehanort's control and allow the shadow to reclaim Terra's body, restoring him. Aqua, Terra, and Ventus then share in a tearful reunion, happy to be together again for the first time in over a decade. After Master Xehanort successfully summons the χ-blade and unlocks Kingdom Hearts, Ventus, Terra, and Aqua regroup with the others. After sharing a glance with Roxas upon noticing their similarity, Ventus aids Sora in trapping Xehanort, who acts as a portal himself due to his existence transcending both space and time - something his younger self had unintentionally revealed to Riku during the Mark of Mastery. Ventus remains in the Keyblade Graveyard while Sora uses the portal to fight Xehanort, alongside Mickey, Riku, Roxas, Xion, Lea, Aqua, and Terra, in order to close Kingdom Hearts. Following Xehanort's defeat, Ventus journeys through the portal to Scala ad Caelum alongside the other guardians of light. Here, Eraqus's heart emerges from Terra's and demands that Xehanort hand over the χ-blade. After some convincing, Xehanort relinquishes the χ-Blade to Sora, at which point Eraqus turns his attention to his former pupils, apologizing to them for everything he'd put them through in a tearful reunion before allowing his heart to move on alongside Xehanort's. With everything as it should be, Sora uses the χ-blade to bring them all back to the realm of light. After leaving his Wayfinder at Eraqus' grave at the Land of Departure, Ventus notices Chirithy spying on them, and calls to it with open arms. The Chirithy bounds over happily and leaps into his arms, cuddling him before being introduced to Aqua and Terra. After some time, Ventus joins Terra, Aqua, Riku, Mickey, Donald, Goofy, Lea, Isa, Xion, Roxas, Hayner, Pence, Olette, and a newly restored Naminé in a fun day at the beach, though Kairi, who Sora had helped restore, remains separated from the group with Sora, who then disappears. Ventus and Terra say Sora's name. Ventus sleeps on a bench outside in the Land of Departure before Terra wakes him by approaching him. They both smile and look up to the sky while uttering Sora's name with a sense of renewed hope. The significance of this scene has yet to be revealed, since Terra is trapped inside Terra-Xehanort, Ventus is inside Castle Oblivion and the Land of Departure is itself Castle Oblivion. Ventus in his Keyblade Armor. According to Tetsuya Nomura, he is approximately 16 years old. Ventus bears an uncanny resemblance to Roxas, bearing identical facial features. Further highlighting this resemblance is Ventus's outfit, which is strikingly similar to Roxas's own Twilight Town clothes. He wears a jacket that resembles a fusion of Roxas's jacket (white on the right side) and Sora's jacket in Kingdom Hearts II (black on the left side), also reminiscent of the Yin and Yang symbol. The collar of the jacket is red and pleated, again, similar to the collar on Roxas's own jacket. Underneath this, he wears what appears to be a grey vest with a single button and several white, angular patterns on it. He wears a third layer under this, in the form of a plain, high-necked, black shirt. He also has a chunk of dull green and grey armor on his midsection that appears to be under his vest, and another piece of armor on his left shoulder. Ventus's pants are also similar to the pants Roxas wore, though Ven's balloon outward slightly before closing up about halfway down his legs, similar to caprice pants. These pants are colored in shades of grey, black, and white. He also wears an ornate, dull green and grey piece of armor on his upper-left arm, along with a black and white checkered wristband that is, once again, strikingly similar to Roxas's, but with white edges as opposed to Roxas's black-edged wristband. Like Aqua, he wears two criss-crossing straps on his chest, on which he wears a silver Keyblade Master emblem. His boots are rather odd when compared to Aqua's and Terra's, as they resemble an armored version of normal street shoes in shades of dull green and grey. When touching the piece of armor on his shoulder, Ventus becomes fully clad in armor. In Birth by Sleep, Ventus's suit of armor shares the coloration of the pieces he normally wears, predominantly sporting shades of green and gold. In this suit, Ventus adds a yellow cape to his outfit that is discolored, almost appearing rusted. The armor on his knee is gold and bears a sharp, upward-pointing hook on the outer side of each one. Ventus's helmet has a notably different design from Aqua and Terra's, appearing more squashed and flat at the top. His helmet also has two prongs on either side of his head which point backwards and angle diagonally upward. Strangely, Ventus's boots are colored completely gold in this outfit, as opposed to the multi-colored ones he normally wears. In Kingdom Hearts Birth by Sleep, Ventus's armor is altered. He loses his cape, his boots change to more closely resemble those in his unarmored state, and the coloration changes much more than Terra or Aqua's. Ventus's armor loses the greens entirely, now sporting steel blue, gold, and black armor, with several red lines decorating it. His name means "wind" in Latin, similar to how Sora's name is Japanese for "sky". The official Japanese website refers to Ventus as the "Swift Wind Returning to Bonds" (絆巡る疾風, Kizuna Meguru Shippū?). During his apprenticeship with Master Xehanort, Ventus appears to be a very timid boy who did not particularly have the courage to wield a Keyblade, leading Xehanort to create Vanitas. After waking up from the coma caused by Vanitas's creation, Ventus becomes far more fragile, becoming wrought with anguish just by being talked to. However, the time he spends with Aqua and Terra, as well as his amnesia, causes him to change. In the present day, Ventus has many similarities with Sora: he is sweet, cheerful, curious, and gets excited at anything new or interesting. As the youngest of the three Keyblade warriors, Ventus is often protected by Terra and Aqua, and thus feels disappointed whenever they refuse to allow him to join them on their missions because they do not want to put him in danger. When he gives them their passes to Disney Town, he grudgingly mentions that Scrooge McDuck told him to "take two grown-ups," but he doesn't seem to dislike his status as the youngest of the three. He also makes new friends easily in different worlds and cares deeply about Terra and Aqua. Ventus is very much unable to cope with Terra turning and subsiding to the darkness in his heart. Some of his traits and personality might have passed on to Sora when his heart joined him. Along with his kind personality, he also shows a lot of bravery, especially evident when he battles Vanitas for the final time, where he promises to fight for his friends no matter what, knowing the fact that he would lose his heart as a result. Ventus's mannerisms are also echoed by Sora and Roxas; in particular, when standing around he often places his hands behind his head, in the same stance that Sora uses. Another example is in the opening video; Ventus is shown falling through a Station of the Dive to the Heart due to the Kingdom Key and Soul Eater shattering the pillar, in a similar way to how Sora and Roxas fall from shattered Stations at the beginning of their games. At the beginning of his episode at the Land of Departure, Ventus falls asleep outside after watching a shooting star, and a little while later, he yawns, and then is startled to find Aqua standing over him, who giggles upon his reaction and teases him affectionately, mirroring how Kairi startled Sora awake in the original Kingdom Hearts. Ventus utilizing his exclusive Command Style, Fever Pitch. Out of the main protagonists of Kingdom Hearts Birth by Sleep, Ventus is the fastest and most agile, which reflects in his primary fighting style of dodging, quick movements and swift combo attacks. Ventus has an affinity for the wind and Light elements and mixes both into several of his techniques and magic attacks. Ven's primary battle style consists of very fast, wide backhanded strikes with his Keyblade in quick succession to deal damage. His single strikes aren't as powerful as Sora's two-handed strikes or Terra's powerful blows, but his ability to attack quickly makes up for his lower attack power. In addition to his swift standard attacks, Ventus has access to a variety of exclusive attack commands in Kingdom Hearts Birth by Sleep. Ven can use his natural affinity for acrobatics to unleash an extended version of the Ars Arcanum-Combo and exhibits advanced Keyblade-throwing abilities like Wind Raid, Spark Raid and Treasure Raid. Using his wind affinity, Ventus can use Tornado Strike to sweep his opponents away. Another exclusive, ultimate attack, Salvation, enables Ventus to use his light affinity to its fullest. Ventus also makes heavy use of his wind powers in his personal finishing commands, the Air Flair series and his ultimate finisher, Stratosphere. Lastly, Ventus has another "Finish" Command exclusive to him, which is called Celebration. Although not as skilled in magic as his classmate, Aqua, Ventus has access to a broad variety of magic spells as well as two spells exclusive to him in Kingdom Hearts Birth by Sleep. These two spells are Tornado and Faith. Tornado creates a powerful gust of wind that absorbs enemies, while Faith creates a powerful burst of light around Ventus. Beside a variety of these abilities usable by all three or two of the protagonists in Kingdom Hearts Birth by Sleep, Ventus has access to three unique Command Styles and two exclusive Shotlocks. His first personal Command Style, Fever Pitch, which is gained near the beginning of the game, lets Ventus use his speedy combat style to its fullest. The second exclusive Command Style, Cyclone, is a powerful 2nd level Command Style which has Ventus use his wind powers to attack with wide-ranged spinning slashes in all directions. Ventus's third exclusive Command Style is called Wingblade. By activating this second level Command Style, Ventus discards his Keyblade in exchange for six silver-white glowing swords of light which float behind him like six glowing wings, reminiscent of the picture of a Seraph, a six-winged Angel. Ventus also has access to two unique Shotlocks, as well as a third just for storyline purposes. The two freely usable Shotlocks are Pulse Bomb and Multivortex. The third exclusive Shotlock is Dark Link, which can only be used when in a Dimension Link with Vanitas in Ventus's final battle. Small and spry, Ventus has access to the already well-known Dodge Roll technique, as well as an offensive variant named Thunder Roll. Furthermore, he can use the Glide and Superglide abilities as well as another offensive version called Fire Glide. The Reversal command allows Ventus to quickly dodge an enemies attack and rush behind it, similar to the Reaction Command in Kingdom Hearts II used against the Dusk Nobodies. Ventus becomes a D-Link for Terra and Aqua after they receive Aqua's handmade Wayfinders. While in link with Ventus, the user can use swift and quick commands, which reflects Ventus' speed-oriented fighting style. Ventus's Keyblades are primarily balanced in terms of attack and magic power. His versions of common Keyblades are shorter in length compared to Terra and Aqua's; this helps him better wield them in his signature backhand style. In the age of fairy tales Ventus used the Keyblade Missing Ache. By the time he became Master Xehanort's apprentice he was using Wayward Wind. Ventus has three exclusive Keyblades; his default Keyblade, Wayward Wind, along with Frolic Flame and Lost Memory. Frolic Flame is obtained after Ventus meets Lea and Isa, and Lost Memory is received when Ven remembers his past on Destiny Islands. Terra's Wooden Keyblade, passed down to Ventus.